Alright! For all you old timers that used to wake up mom and dad to watch the Smurfs on Saturday mornin’ you’re in for a treat. While the blue gang won’t make an appearance I do have some Saturday mornin’ trenchin for you. On this 1st down look, Georgia comes out in a run formation. 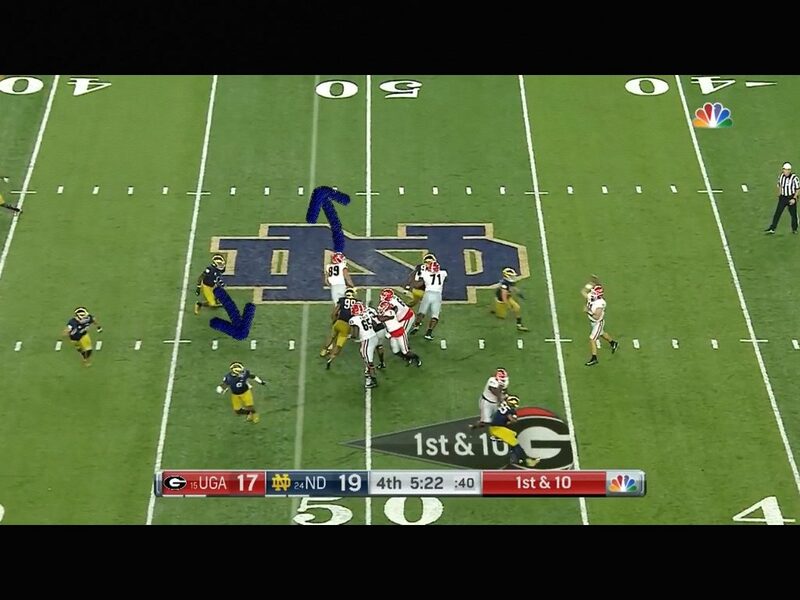 Fromm is a very smart player. 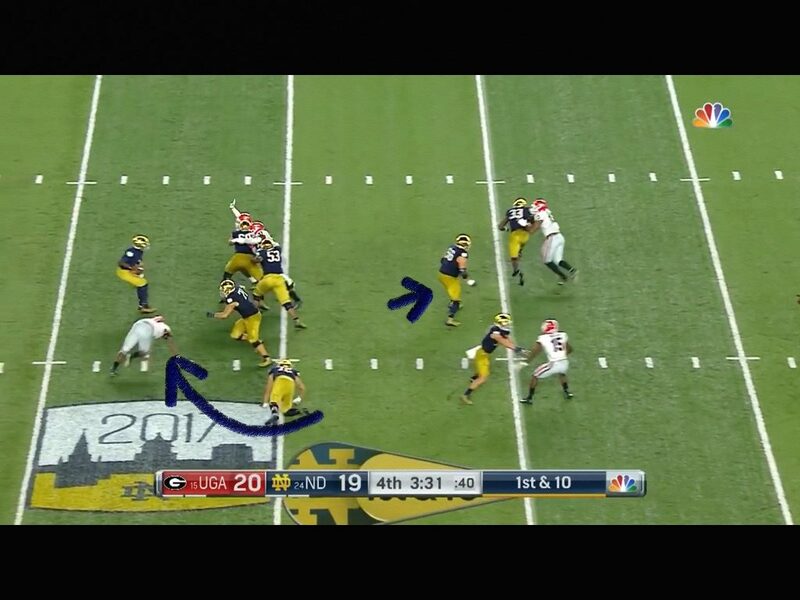 The outside backer I have circled isn’t showing blitz. So he reads he has zone to his right, and man to the bottom. 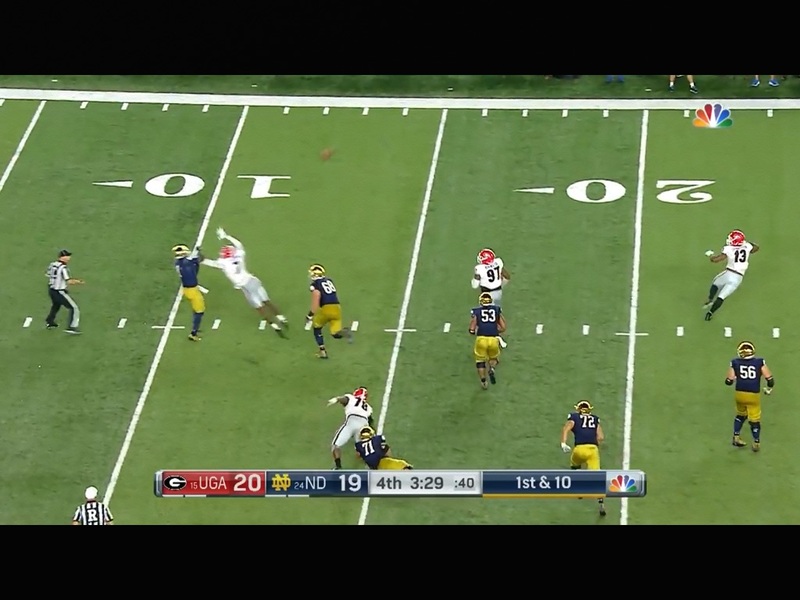 Fromm also understands that on 1st down, the free safety is most likely going to be peeking in the backfield for a run play. 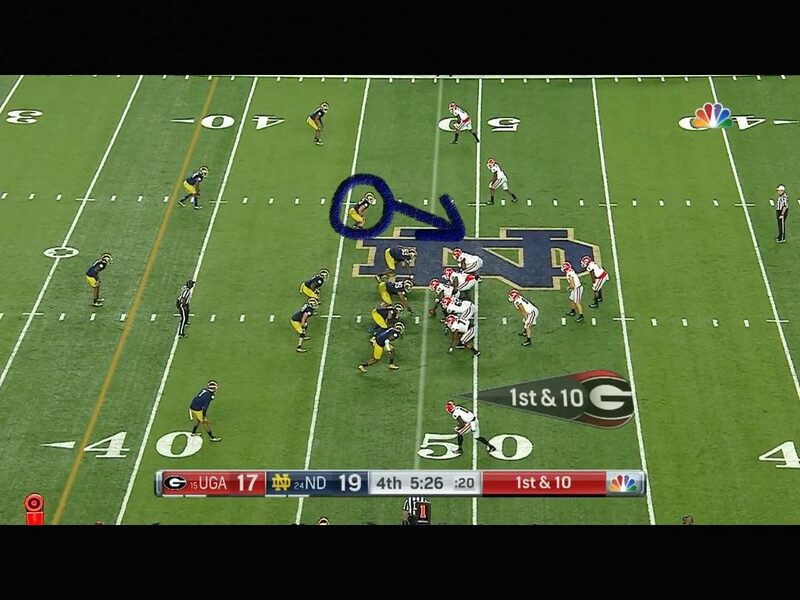 After the snap the outside linebacker I circled comes on a delay blitz. Fromm “feels” that and understands he has one on one to the outside with a 6’4″ receiver. He also understands that he needs to get rid of the ball and it’s only 1st down. An incompletion here at midfield isn’t the end of the world. If he has more time, he could drop it off to his tight end coming open on the logo, but he needs to get rid of it quick. 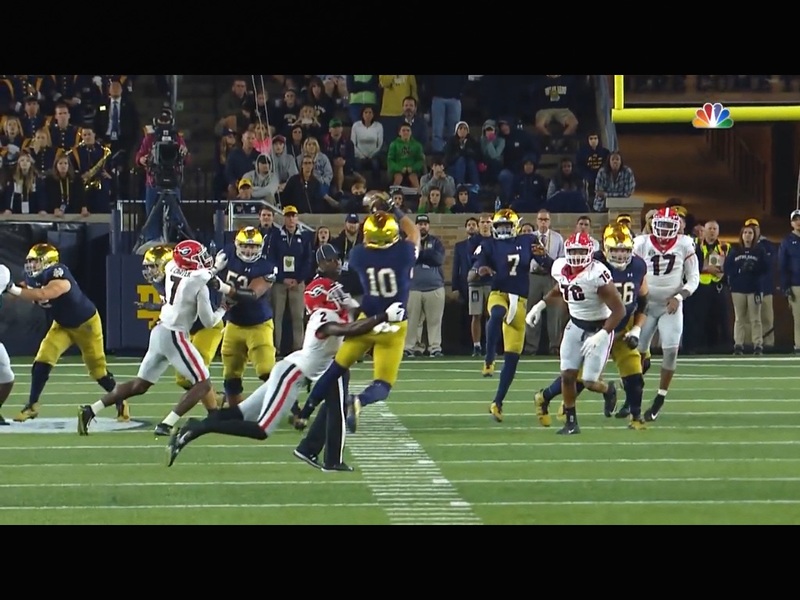 And this is what scares me about Georgia receivers. 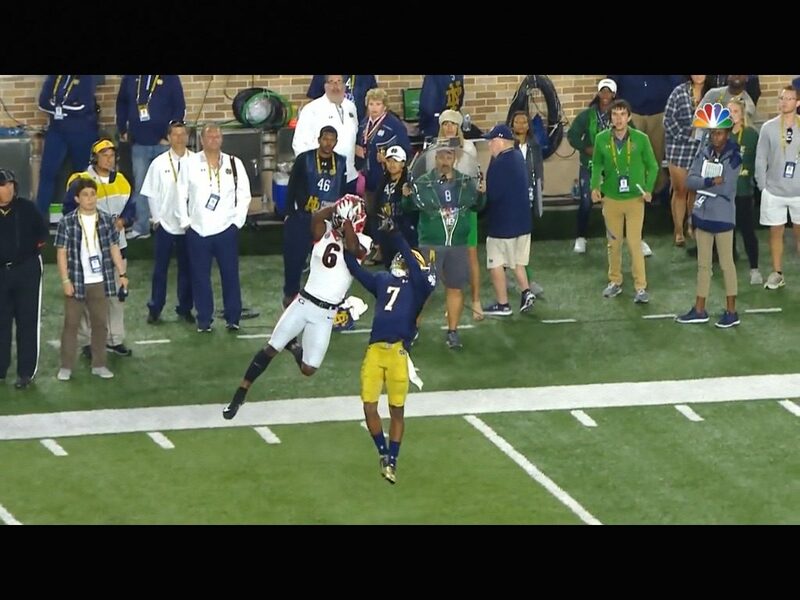 Not only is the guy 6’4″, look at how much higher he is up off the ground. He makes a hell of a play that ends up being one of the key plays that helped them win. Later here in the 4th quarter Georgia finally pinned their ears back and started coming. Up until this point we didn’t see a whole lot of fearsome foursome stuff. Early in the year though you can tell that the Notre Dame O Line wasn’t very sharp between the ears. This game was played the same week we played Ohio State, so while our guys were sharp up front, the Irish weren’t. Why I say that is the Center #56 (blue arrow) has to be looking for work here. He needs to be helping someone after the linebackers show they aren’t coming. 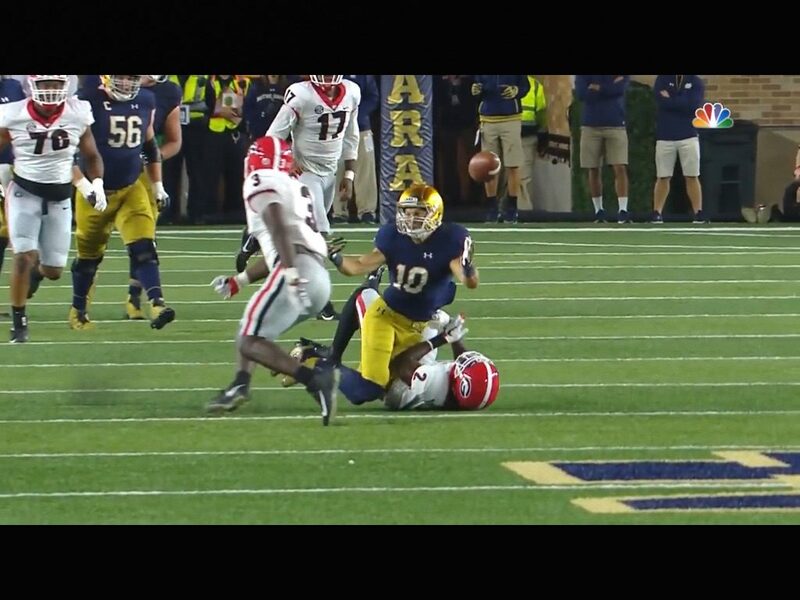 #7, Lorenzo Carter for the Dawgs, 6’6″243 beats consensus All American #68 Mike McGlinchey to get pressure on the Irish QB. 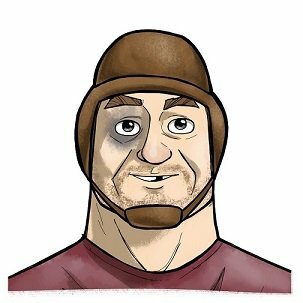 The thing i’ve noticed is that when there’s the threat of a run game, the pass rush isn’t that fearsome. However, when Georgia doesn’t have to worry about a run game, their pass rushers, namely Carter and Bellamy are legit. So it’s to be expected that Georgia is going to win some plays. 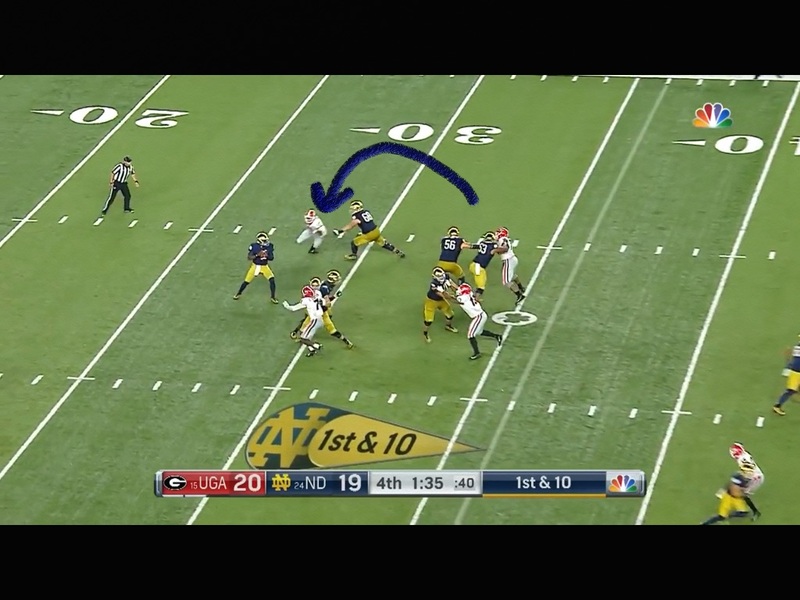 Still, the Irish OL came back strong a couple of plays later and gave picture perfect protection to Wimbush. He has to make this play. 3rd and 10, down by 1 point with some time on the clock, he has to make this play. 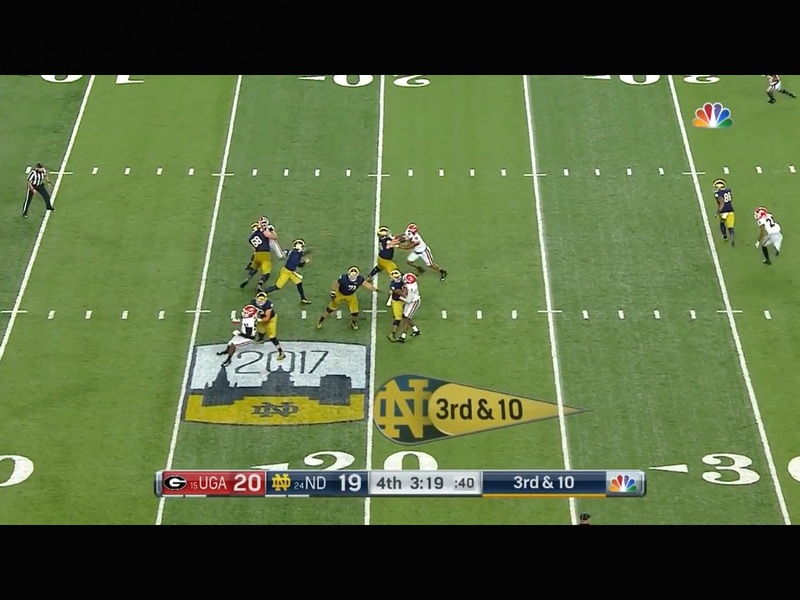 Watching the Notre Dame, Miami game, I think a lot of the turnovers the Irish had in that game turning it into a rout early, was due to drops/deflections from Irish receivers. After watching our receivers all year, I think our guys are better, and I believe Baker has much better escapability and is much more accurate. Here again, McGlinchey gets beat. This time by Bellamy. Dude you’re an All-American. You can’t get beat. He let’s Bellamy run the hoop on em while there’s great protection everywhere else. 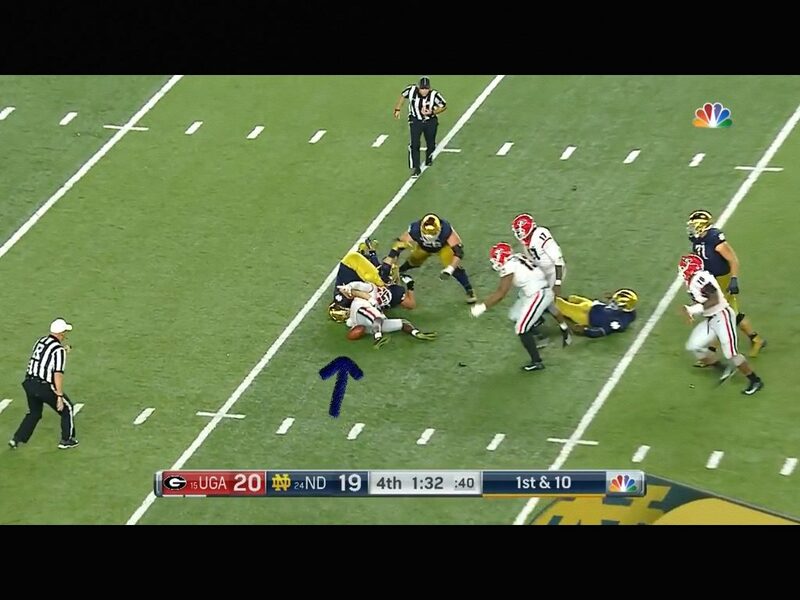 And it’s a strip sack which the Dawgs recovered. Ballgame. If the Sooners are going to win this thing, they have to be able to run the football to keep Georgia off balance. The unpredictability of the play calls will make the Sooners tough to beat. Still though if the Dawgs can make the Sooners one dimensional, this will be tough.